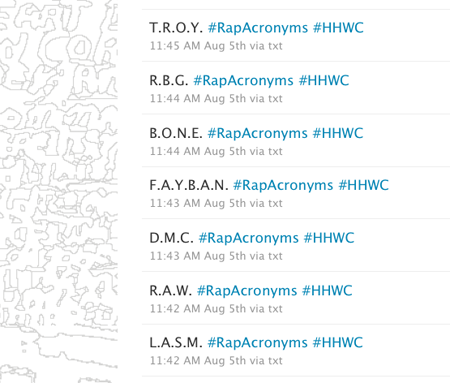 I recently used my morning commute to the studio to write down a list of acronyms found in Rap music. The first 3 people to send a correct list of what the acronyms stand for get a STCR gift in the mail. Shout out to @jeffdtaylor, @Combat_Jack, @meaganshea, @Gudtyme @MattyHo & @minchovega for adding on.